First of all, one quick change. The Weekly Chunk will now happen on Thursdays WITH the Weekly Snapshot! In case you missed it, we announced MINECON 2012’s location. Check our YouTube channel for the details. Registration will open in the next week or two. This week we are very excited to announce our second partnered Minecraft app - meaning community members made it and it was so amazing we wanted to make it an official Minecraft app. 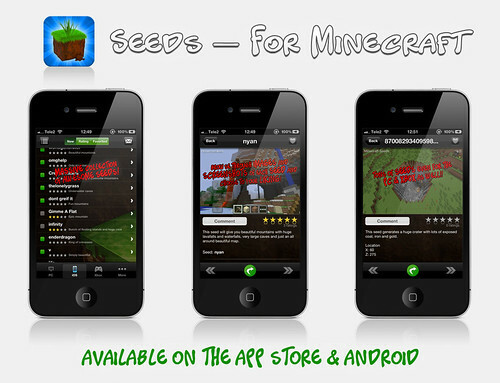 Two brothers, Nahir and Jean created this app for all things Minecraft seeds. Seeds are curated and rated. You will even see photos and descriptions of each seed. Not only can you check out seeds in the PC version, but there are also ratings and suggestions for seeds on the Pocket Edition and Xbox version! If you’re looking for something specific, such as mushroom biomes or strongholds, you can check that off and see those specific seeds. For $0.99 you will never need to try and figure out a good seed again! It’s also available on the Kindle Fire and for Android. This is a REALLY great app! Check it out now!